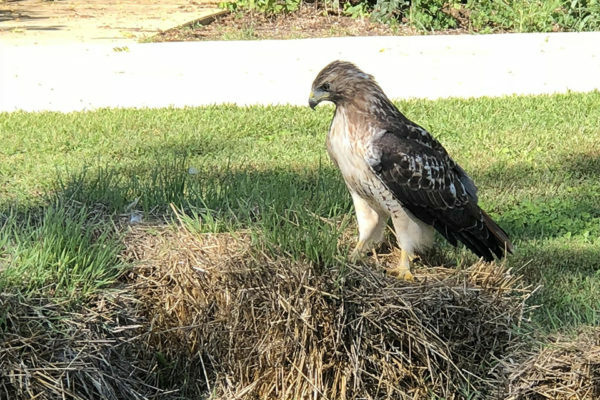 Many visitors to the Kansas Children's Discovery Center this summer have gotten to meet the Red-tailed Hawk who has taken up residence in our Certified Nature Explore Outdoor Classroom. At 4.5 acres, and full of native plants and trees, the Outdoor Classroom makes a great home for a hawk. Kids have really enjoyed getting to see this beautiful bird, especially when it takes flight! Carol Morgan from the Topeka Audubon Society helped us identify our hawk as a Red-tailed Hawk, based on the reddish tail, the most recognizable field mark. "Most have a white chest and a dark 'belly-band' of streaks. However, there can be very dark or very light individuals." Carol wrote, "These hawks are found across North America in abundant numbers. Red-tailed Hawks are more common in the winter in Kansas, because there is a shift from migration and many birds come south from Canada." Like all birds, Red-tailed Hawks are modern relatives of dinosaurs, and these hawks are raptors, part of a family of birds of prey that eats mice and other small mammals. Seeing wildlife is just one of the reasons our Certified Nature Explore Outdoor Classroom is serious fun. Nature Explore Outdoor Classrooms offer interactive elements such as musical instruments made of natural materials, garden and pathway areas, and natural materials for building and creating art. Research consistently shows that children who learn and grow in Nature Explore Classrooms exhibit enhanced concentration, develop creativity and problem solving techniques, manage stress in healthy ways and develop skills across the spectrum of academic and creative learning.